WENCHANG, Hainan, April 20 (Xinhua) -- China has taken another step toward its goal of putting a space station into orbit around 2022, by sending its first cargo spacecraft Tianzhou-1 into space on Thursday evening. 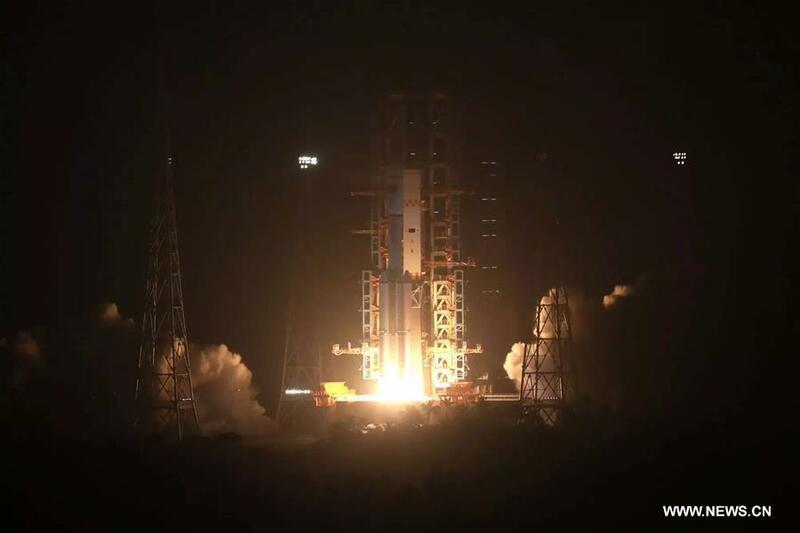 Atop a Long March-7 Y2 carrier rocket, Tianzhou-1 rose into the air from the Wenchang Space Launch Center in south China's Hainan Province at 7:41 p.m.
China declared the launch a success after it entered designated orbit minutes later. The cargo ship will dock with the orbiting Tiangong-2 space lab where two Chinese astronauts spent 30 days in the country's longest-ever manned space mission, provide fuel and other supplies to the latter, as well as conduct space experiments before falling back to Earth. If the Tianzhou-1 mission is successful, China will become the third country besides Russia and the United States to master the technique of refueling in space. China aims to build a permanent space station that is expected to orbit for at least 10 years, and the debut of the cargo ship is important as it acts as a courier to help maintain the space station. Without a cargo transportation system, the station would run out of power and basic necessities, causing it to return to Earth before the designated time. "The Tianzhou-1 mission includes the breakthrough of in-orbit refueling and other key technology needed to build a space station, laying a foundation for future space station operations," said Bai Mingsheng, chief designer of the cargo ship. Measuring 10.6 meters long and boasting a maximum diameter of 3.35 meters, the Tianzhou-1 cargo ship has a maximum takeoff weight of 13.5 tonnes, and could carry over 6 tonnes of supplies. Tianzhou-1 is larger and heavier than Tiangong-2, which is 10.4 meters in length and has a maximum diameter of 3.35 meters, weighing 8.6 tonnes. Bai said that supplies loaded on the cargo spacecraft are nearly as heavy as the ship's own weight, exceeding the loading capacity of Russian cargo ships in active service. Tianzhou-1 will dock with Tiangong-2 three times, said Bai. After the first docking, aerospace engineers will test the controlling ability of the cargo spacecraft over the two spacecraft. The second docking will be conducted from a different direction, which aims to test the ability of the cargo ship to dock with the space station from different directions. In the last docking, Tianzhou-1 will use fast-docking technology. Previously, it took China about two days to dock, while fast docking will take about six hours, according to Bai. Refueling is conducted during docking, a process that is much more complicated than refueling vehicles on land. The refueling procedure will take 29 steps and last for several days each time. This means the Tianzhou-1 will stay in space for about six months. It will fall into a designated sea area after fulfilling its tasks. Space cargo ships play a crucial role in the maintenance of a space station. Cargo ships can send all kinds of supplies to the space station which can be an experiment field for developing technology in space. Huang Weifen, a deputy chief designer of the Astronaut Center of China, said that supplies carried by Tianzhou-1 include goods that will meet the basic living and working needs of three astronauts for 30 days in space, including drinking water, oxygen bottles and nitrogen bottles. Also onboard include facilities for microorganism tests, and sensors are installed to obtain data such as mechanics and temperature for the future design of the space suit outside a spacecraft. "We hope to gather relevant data through this mission and accumulate experience for sending material for the future space station," she said. Although China has achieved many giant steps in space exploration, the country's space odyssey is far from over as it eyes building its own space station and far beyond that: landing on Mars. In 1992, the central authority approved a three-step manned space program. The first step, to send an astronaut into space and return safely, was fulfilled by Yang Liwei in Shenzhou-5 mission in 2013. The second step was developing advanced space flight techniques and technologies including extra-vehicular activity and orbital docking. The final step will be able to operate a permanent manned space station. Chinese scientists said they plan to launch a core module of the country's first space station around 2018, followed by two experiment modules. The station in the primary stage will be composed of three modules: core module, experiment module I and experiment module II. Each module will weigh more than 20 tonnes and together the three will be structured in the shape of T. The core module will be in the middle with an experiment module on each side. During its operation, the space station could be linked to one additional cargo ship and two manned spacecraft at one time, and the maximum weight of the whole assembly could reach up to 90 tonnes. Based on such design, scientists will keep updating capsules in accordance with scientific research and extend their abilities. With the International Space Station set to retire in 2024, the Chinese space station will offer a promising alternative, and China will be the only country with a permanent space station. So far, China has successfully launched 11 Shenzhou series spacecraft, including six manned spacecraft that lifted 11 astronauts into space. The country strives to realize the third step of its lunar program in 2017: sending Chang'e-5 lunar probe onto the moon which will return with samples.